Hope you all had a fun weekend! I’m actually coming back from a quick weekend trip to Austin today. I was in town for my step-brother’s wedding, which made doing Whole30 difficult, but I had my mom go to the store for me before I got there so I’d have everything I need to stay on track. The not drinking part was probably the most difficult for me this weekend, especially for such a celebratory occasion! I actually have a friend coming in town this coming weekend and she’s staying with me, so I may need to break the Whole30 challenge for just one night for a drink or two. We’ll see if I can hold out! These photos were taken on the day we got some snow a couple weeks back. If you look closely at the photos, you can actually see a couple of teeny tiny snowflakes! The most noticeable one is in the first photo right at my hairline. About ten minutes after these photos were taken, it was a full on flurry outside. We got inside right in the nick of time! It was 25 degrees out when we took these photos – I promise I was wearing socks, they’re just the kind that doesn’t show! I definitely could’ve used gloves though… my hands were bright red by the time we were done shooting! So freaking cold. 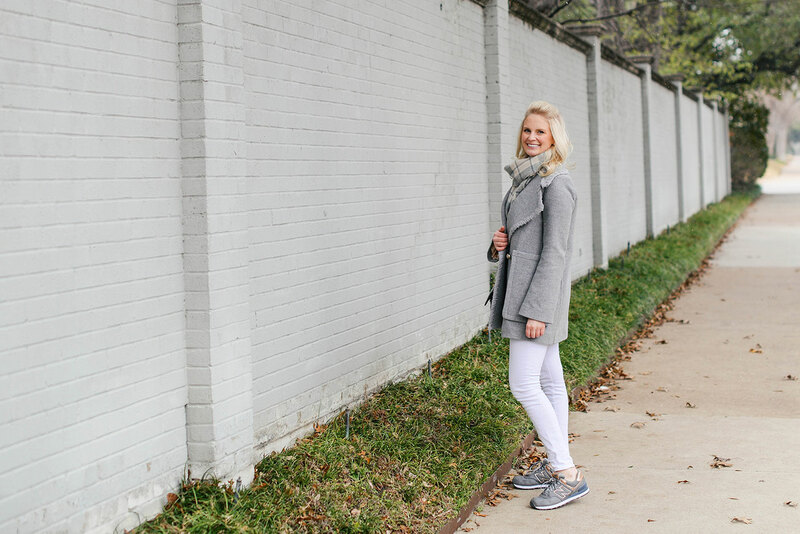 I’ve loved having this See by Chloe coat for dressing up my everyday errands looks though… The silhouette is just a touch more feminine and tailored than the other coats in my closet, so it’s a great piece to grab when I want to look a little more sophisticated. The subtle chain detail on the neckline and dainty little buttons on this wool coat make it a sophisticated winter staple. 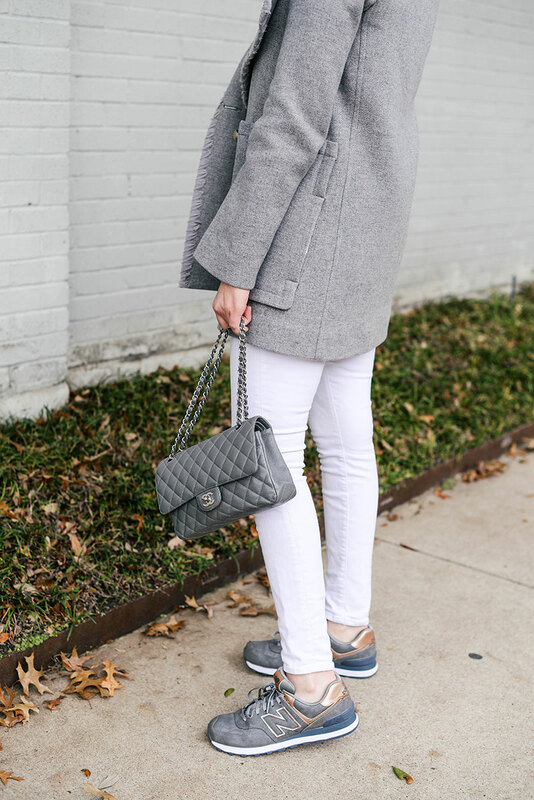 Loving the contrast on this pure white + grey Club Monaco coat. A great everyday coat! Nothing like a good exaggerated collar, am I right? Love this little peacoat, on sale for a whopping $33. Y’all know how much I love my neutral belted trench – this similar one is incredibly chic and marked down 40%! This soft pink puffer coat is ideal for casual weekend errands to throw over your favorite athleisure looks. Another fab oversized collar coat is this one by T Tahari. 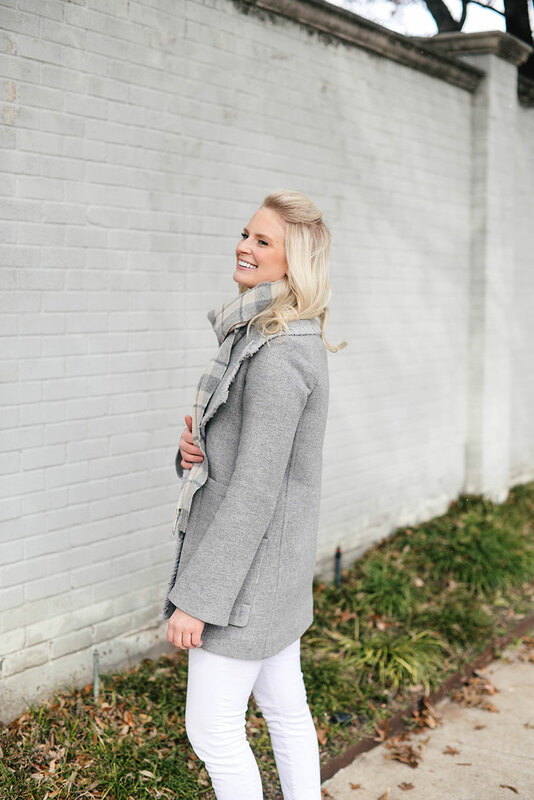 This simple wrap coat will become an instant classic in your closet. You’ll reach for it year after year! If you like a little more color, this bottle green coat is subtle but striking. This coat is just gorgeous. How cute is that coat! I love the details on the lapels!Those NB kicks are super cute too. Oh my gosh…giving up wine is the one thing I can’t seem to do. You go girl…that’s impressive to stay on board through a wedding. Good job! I love the grey & white here! I’m still looking for the perfect pair of white jeans. This makes me want to pick up the search again. Loving the grey and white girl! Such a good, casual and cozy look! I love the sneakers! The gold accents are so chic. This is just the perfect casual look! I’m a sucker for a good pair of sneakers and these are too cute! Perfect weekend outfit! 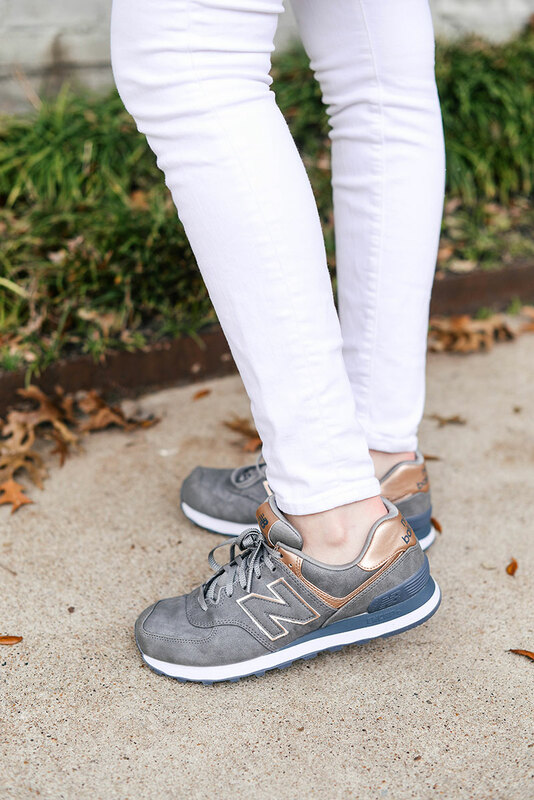 Loooove how sneakers are the cool thing to wear now! They’re so cute on you! I love your grey and white pairing. Those sneakers are so fun. Whole 30 is tough. I did it once and enjoyed it but it is tough! That coat is just the best!!! I’m really starting to love Chloe. Great ensemble! LOve your shoes!